Kerckhaert’s unique ability to design front and hind shapes, allows the user to minimize the amount of shaping work necessary to get an optimum fit. The shoes are symmetrical - not left and right as in the European styles. 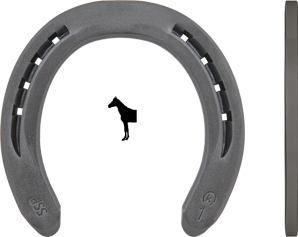 The unique beveled edges of the material provide a safe and professional finish to the shoeing job. There is no other shoe in the market that offers the features of this light but strong, front and hind shoe. This is a shoe with many purposes used throughout North America and Europe as well.